Days before Ramadan, a deeply spiritual month, Maryum “May May” Ali buries a man whom the splintered world collectively mourns. That the two coincide during such vitriolic times seems an extraordinary coincidence. The loss of Muhammad Ali – the only globally celebrated black and Muslim athlete – becomes a necessary paradigm for the intolerant present. “[My father] looked at his religion and the inequalities in the world and he saw himself being equal to every other African-American or downtrodden person,” Ali’s eldest daughter, Maryum, reflects a week after her famous father’s burial and televised memorial. Indeed the legendary boxer’s draw was his stentorian voice that confronted injustice and represented his beliefs on the public platform. He was the quintessential alpha male, his daughter recalls. “There was not a wave of energy that went against him,” she adds. His well-documented life attests to how defiantly Ali charted his own course. That confidence to stand for something earned him the love and respect of the people who saw themselves in him. “I am them and they are me,” he once told his daughter. The poignancy of his words within the context of his deeds is what made him The People’s Champ. Even in death, his connection with people was palpable. Though relatively obscure in the public eye, Ali’s daughter isn’t much different. She too sees herself in her community and uses her platform to help at-risk youth. And like her father, Maryum’s natural certitude permeates her often-unfiltered speech, challenging current political rhetoric and socioeconomic discrepancies. Problems like mass incarceration and economic disparities that plagued her father’s time are still relevant today, she feels. But nobody challenges them the way he did, she thinks. Ali went beyond symbolic gestures of protest and consistently resisted oppressive norms, even when it touted controversy. His was no silent or scripted rebellion. When some athletes stood against police brutality toward African-American men in the past, “they got torn apart for [it],” Maryum reveals. Others were instructed “not to be a hero in the neighborhood.” Their activism was relegated to selective philanthropy. 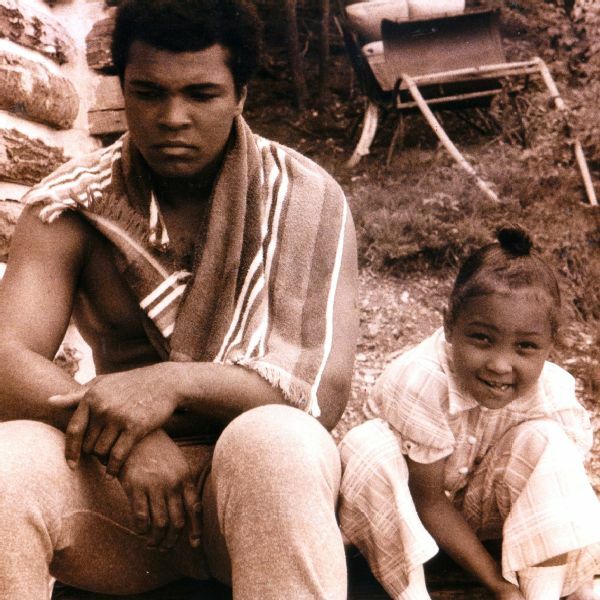 Muhammad Ali with his daughter Maryum. Maryum believes that her father’s existence informed institutions how to condition others so they wouldn’t follow suit. “[They] didn’t want a bunch of Muhammad Alis running around, you better believe that one,” she states. Apart from his intrinsic candor, Ali made conscientious choices to be who he was regardless of his wealth and fame. “I don’t care about the money. I gotta die and meet [God],” he’d exclaim. The difference in Ali’s choices was also a result of his strong faith, which the media generally glosses over when highlighting his trademark confidence – behind the rope and the mic. “If he contemplated anything, it was based on ‘what does my faith tell me to do.’ He didn’t care about what John was saying over in the corner. John didn’t hold a candlelight to his God,” his daughter contends. Ali’s religion gave his voice reason, his mind strength, and his relationships guidance.